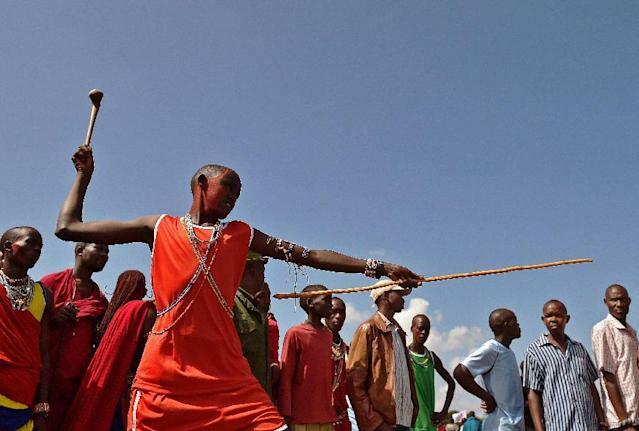 Kimana (Kenya) (AFP) - Leaping high into the air and hurling spears instead of javelins, traditional lion hunters in Kenya tested their skills Saturday in a special "Maasai Olympics" organised to save the endangered animals. For generations, Maasai warriors proved their manhood by killing a lion, but a campaign led by Kenyan Olympic champion David Rudisha is working to swap spearing for sport. As numbers of big cats rapidly decline due to poaching and humans' increasing encroachment on their territory, the games organised Saturday by conservationists aimed to provide an alternative test of the warriors' strength. Rudisha, the 800 metres gold medallist and world record-holder -- and himself a Maasai -- is patron of the games. "I'm happy to come here and be a part of my people, and to try and educate them about not killing the wild animals, because we get a lot of benefits from it," Rudisha told AFP, as barefoot athletes sprinted past on the hard dirt track. In a Kenyan twist on classic athletics events, warriors threw spears instead of javelins. Daubed in red paint, dressed in colourful Maasai robes and draped in beaded necklaces, warriors competed in the plains beneath the snow-capped peak of Mount Kilimanjaro, Africa's highest mountain. They also hurled the Maasai's heavy wooden fighting club instead of discus, with the winner determined by the accuracy of the throw. "I'm also trying to be a role model to them, to show that sports can change your life, from being someone to being somebody," Rudisha said, as hundreds of spectators roared encouragement for athletes from their village, sprinting past on the wide savannah grasslands. "Sports have really taken me far, I've been all over the world, and it's only because of running," he added. Running races included 200-metre, 800-metre and 5,000-metre distances for men, and for women, 100-metre and 1,500-metre races. 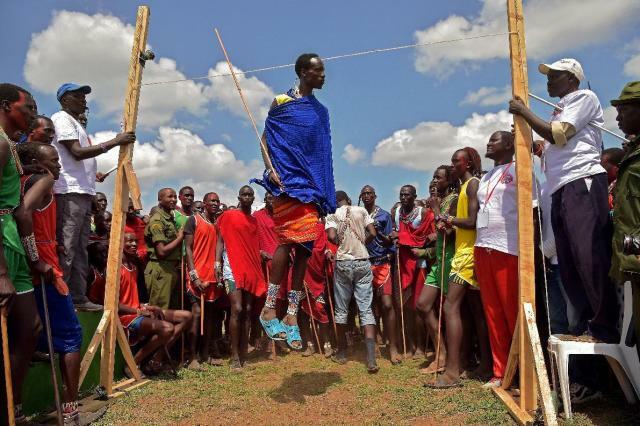 Athletes also took part in a Maasai "high jump" -- measured by the traditional standing jump straight into the air, not over a cross bar. The games offered warriors a chance to compete using traditional skills used in the hunt, but tested instead in a sports competition against each other. Organisers said the games give the Maasai "an avenue to demonstrate their physical prowess through a sporting event rather than a traditional hunt", as well as raising awareness about the threats lions are facing. "Lions are in trouble," said Fiesta Warinwa from the African Wildlife Foundation (AWF), one of sponsors of the games, adding that fewer than 2,000 lions remain in Kenya. Tourists coming to see the lions -- and Kenya's other wildlife including elephant and rhino, also under constant threat from poachers -- provide a key foreign income earner and employer for the east African nation's economy. "These lions could be wiped out in the next two decades unless we act," Warinwa added. "The Maasai Olympics help protect lions through education." Africa's lion population has dropped by almost a third in the past two decades, with 30,000 of the big cats now left across the continent, according to AWF estimates. Prizes included breeding cattle, school scholarships and cash, while the two race winners won a sponsored trip to compete in the 2015 New York Marathon. 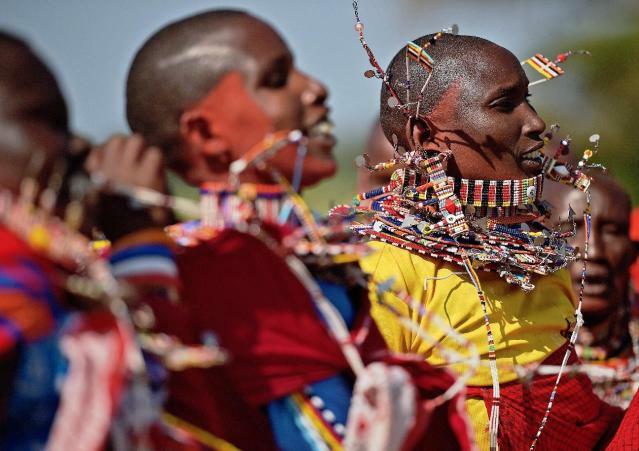 "The Maasai Olympics is more than just a colourful, one-day event," said Samar Ntalamia from Big Life conservation campaigners, a sponsor of the games. "It is a year-long education program that provides us with a platform to engage young men about conservation issues, particularly lion killing." The games, the second time they have been held, took place in the Maasai region of Kimana, some 220 kilometres (135 miles) southeast of the Kenyan capital Nairobi, in a game sanctuary that is part of the world famous Amboseli–Tsavo ecosystem.